On Friday members of Torridon MRT gathered and loaded up into the team vehicles and headed to the Cairngorms. After a quick pit stop at the Happy Haggis for fish and chips the team arrived at Badaguish our luxury base for the weekend. As the evening progressed members chatted about their plans for the following day which was to be a personal skills day for most of the team members while some were on a national Mountain Rescue Scotland avalanche course. It was decided that we would split up into four groups (apart from those on the avalanche course) with two pairs Jim and Duncan plus Rod and Tom opting to go climbing whilst the rest of the members split into two small teams one lead by Arjan and the other by Gerry focusing on winter mountaineering skills / Munro bagging. With the team being away for the weekend down at Badaguish. A few of the recent new team members, Emily, Graham and myself had booked ourselves on the avalanche essential training course. Friday night was spent in Glenmore Lodge. Being a passionate hill walker I was really looking forward to the course. The start of the training was learning about weather, the angle they happen on, different types off avalanches, how they happen, terrain traps, survival rate depending on depth and time buried. We also learned how to use the SAIS website. Then it was on to look at receivers. They are a very interesting bit of kit. Saturday we headed up to Cairgorm to a wee corrie, to put into practice what we had learned from the classroom the night before. All armed with our snow shovel, probe, receiver, where first off all we tested snow to see the layer build up in it. Also to see if it would avalanche. Then it was on to the receivers. We paired up in groups. One would hide the receiver and then the other person would have to find it. After doing this, it was then on to scenarios where we would all head up the hill. The instructor would hide a body with the receiver on it and we would then all do a search. Over all a fantastic course I am glad I attended. 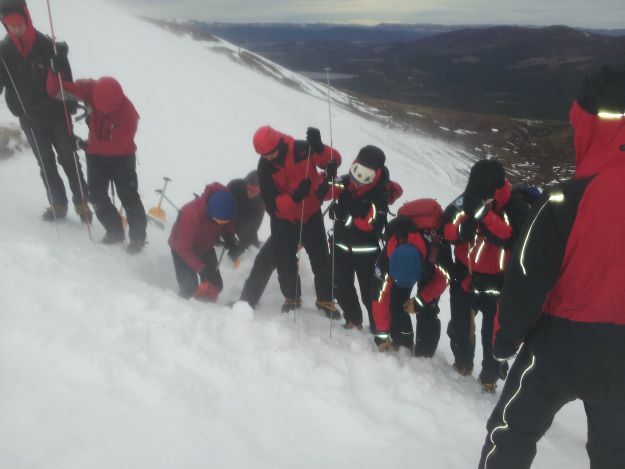 The first day of Torridon MRT’s Cairngorm weekend was for personal skills i.e. do your own thing, so Jim and I headed into Coire an t-Sneachda. We’d spoken to some friends the previous night who’d told us that climbing conditions were excellent but that all runners and belays were buried, We were looking for a low grade winter climb with nobody on it, not that easy at 1030am on a Saturday morning! Jim however soon spotted a nice buttress route to the left of The Runnel. We stopped for five minutes to get geared up and have a hot drink. We then plodded up to the start of the route and found our friends advice to be correct, as we dug round the base of the crag trying to find some protection. Jim was first to lead, didn’t know it then but apparently I was next! Soon he was out of sight and within a short time I heard his call letting me know he was safe. I de-rigged the belay and climbed up to Jim, enjoying the security of the top rope, to find that we were swapping gear and I was continuing on. I headed up about three or four meters and managed to get a good runner in without too much digging then climbed another three metres and looked for another runner. I quickly realised that this was not like rock climbing and that I was not going to get another runner. I carried on up another twenty metres or so where I managed to get a friend into an iced up crack, great! Not happy with this I backed it up with a couple of dodgy wires placed in a horizontal crack. I then relaxed and took Jim up, while listening to the colourful language coming from the adjacent climbers who’d run out full rope lengths and were now desperately searching for gear for a belay. We continued up the route and got to the top just after one. First winter lead and a great start to a fantastic weekend. Saturday saw the team splitting down into different sections looking at a range of different personal skills. Arjan, Greg and I decided to go out into Coire an t-Sneachda and practiced moving on steep ground using the side of the boots, the toe and axe. We then moved onto using a stomper belay for lowering people down a steep slope and then bringing them back up again. Once we were halfway up the side of the corrie we then built ourselves bucket seats looking at having areas for the rope to sit in keeping it clear so it can run freely. We also built platforms alongside the bucket seats for people to be secure on whilst waiting to be lowered or to come off the rope when they have been brought up. After testing the bucket seats we then added a buried axe to the system to make the anchor ‘bomb proof’. As we progressed up the ridge we decided to go up the slope instead of the main ridge line due to the number of climbers on it and that we were looking at the slopes from a Winter Mountain Leader point of view. After we got onto the plateau we started looking at our navigation skills. As we finished the day the confidence levels were up, with more practice before assessments. Andrew, Gill, John and Gerry went to Glen Feshie for some gentle Munro bagging. Sgor Gaoith was climbed by a circular route from the car park 1km before the road end at Auchlean and returning to the car park 0.5km north of Balachroick. 14.3km, 870m and 4hrs 50mins. On the ascent we encountered 2 groups of Gurkhas. They had been snow holing as part of a selection process for a Gurkha expedition to Everest to celebrate the bicentenary of the Gurkha regiment. Sgor Gaoith, 1,118m, is one of the most spectacular Munro summits, perched at the cliff edge 2,000 feet above Loch Einich. We were unable to appreciate it. Clag obliterated all scenery above 3,000 feet but gave the opportunity for some micro nav practice: estimating time, counting double paces and aiming off to avoid the potential cornice. Sadly the delights of home baking in the cafe at Inchriach nursery, eagerly anticipated after Andrew’s glowing recommendation, proved not to be available. Rod and Tom decided to head into Coire an Lochain with our sights set on Ewen Buttress and hoping to escape the crowds. The walk in was excellent with good neve making the approach easy and fast. There were as hoped much fewer climbing teams in the corrie and our route was free of other parties. After traversing into the foot of the route we set about building a belay, which proved difficult due to the large amount of snow on the route. One nut and a hammered in ice axe later we were off with Rod taking the first pitch. Rod easily cruised easily up the steep snowy route but struggled to find gear and after forty metres he placed his first bit of gear and built a belay. I followed up next and then apprehensively took the lead knowing there was little gear to be found. After a short steep section and two slings I had reached the top of the climb. It was pretty windy and by the time we were both at the top we were sporting some pretty good frozen eyebrows. We then headed for the Goat Track and descended to the car park for a well-earned coffee and piece of cake before meeting up with the rest of the guys. That evening we treated to a pre cooked meal from students from Gairloch High School. An excellent cottage pie followed by even better apple crumble washed down with some of our own red wine. Many thanks to the pupils who prepared our evening meal, breakfasts and lunches. The team really appreciated your hard work and real life application of your skills in providing for a large group of hungry individuals! Sunday was designated as Team Training by Jim. He briefed the team after breakfast, we would be covering sessions on buried axe belays; snow bollards; bucket seats, transceiver use and finally probing an avalanche site for a buried victim. So after cleaning our accommodation we were off to Coire na Ciste. Jim chose this venue due to the higher winds this morning and the quick access. The first hour we looked at winter anchors with Andrew showing us snow bollards, Duncan bucket seats and Rich buried axe anchors. We then moved on to avalanche transceivers with Emily and Graham who had been on the avalanche course the previous day. After splitting up and hiding transceivers and finding them again we then re-gathered for the final part of the day. Finally team leader Arjan had mysteriously lost his rucksack in a very specific area of the corrie and it was up to the team to find it using avalanche probes. After much probing and a little bit of help from the avalanche transceiver we had managed to dig out his rucksack. The wind had picked up considerably so with little debate we headed down the mountain and loaded up into the team vehicles (not before a quick photo shoot with a new micro brewery). Back down at the Pine Marten bar the team debriefed over some coffee / beer and cake before heading home. It was a great weekend with many skills learned/practiced and enjoyed by all that attended. Hopefully the start of many more great training sessions for 2014!! Usually meet up at the team base. At Torridon youth hostel. Quick briefing. Off to the training for the day. 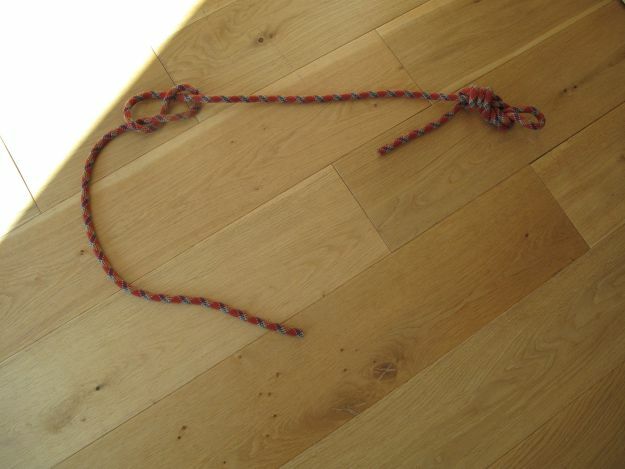 Then first task was to make up a rope lanyards..
Then we’re off to crags above Sheildaig primary school. Short quick hike up the hill. We were then split in to two teams of three. We then set up a 3 point anchor. With Jim reminding us of ‘VIE’ : vector , independent, equalised. Each of the teams then checked over the other teams anchor system. We then did a abseil. Down one rope. Using a ID then ascended the other rope. Either using the ID or a grigri with a jumar. We then had turn about setting up a lower and a hoist. Organizing every thing our self. While Jim stood back and had a watchful eye over us. Midges then started getting bad by this time. so to finish up the day. We went slightly along the hill. Where Jim showed us how to use tat. Round a spike to set up an anchor for a stacked abseil. Usual meet up at the team base. At Torridon youth hostel. Quick briefing. Off to the training for the day. Then first task was to make up a rope lanyards. We then did an abseil. Down one rope. Using a ID then ascended the other rope. Either using the ID or a grigri with a jumar. We then had turn about setting up a lower and a hoist. Organizing everything our self. While Jim stood back and had a watchful eye over us.